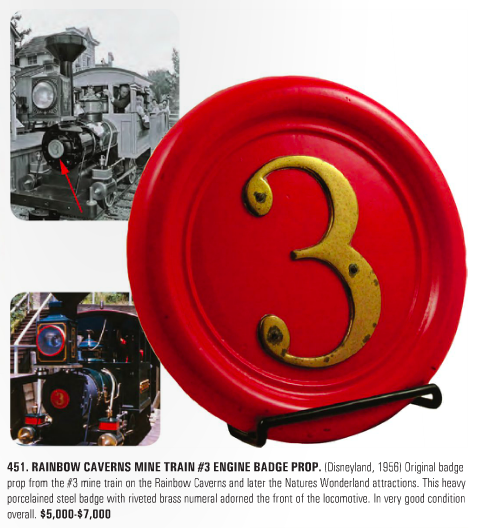 Last week I gave Theme Park University readers a sneak peak at an incredible auction happening in late February 2014 that has Disneyland park fans foaming at the mouth. Admittedly, one of those fans was me. 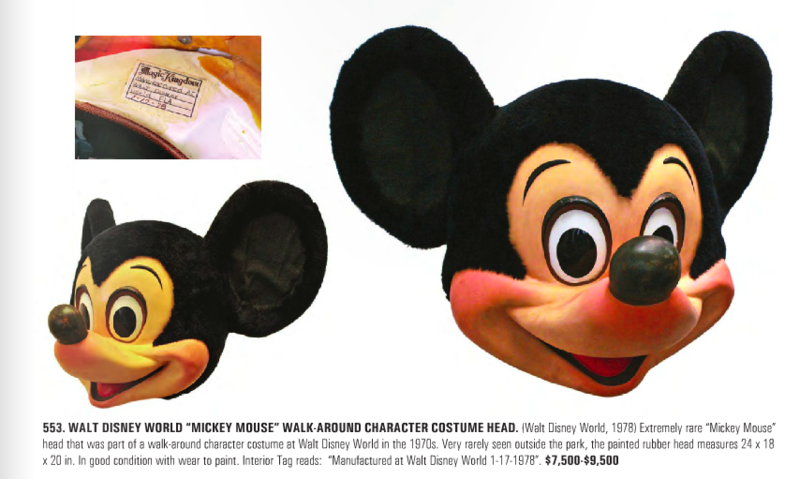 After writing my first article and having a chance to look through the catalog, my jaw was on the floor. I’ve been to several D23 events and have personally toured the Disney archives on more than one occasion. 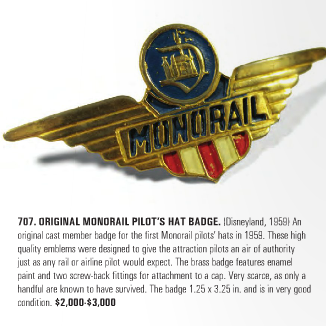 This collection that is being auctioned off is just as impressive as what Disney itself puts on display when they showcase their history and in some ways better. 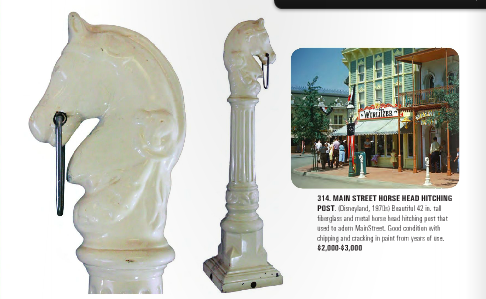 Many of the items come from parts of Disney’s history that you don’t hear too much about anymore, like these signs for the tobacco store that was once on Main Street. 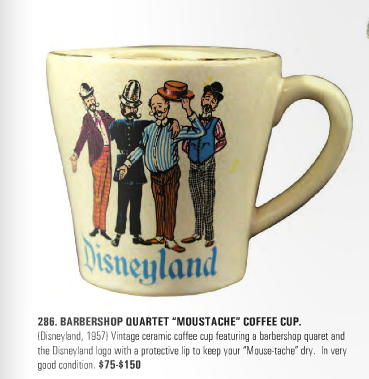 After combing through the catalog (and you seriously should. Click this link and it will take you there), I couldn’t help but wonder: how the hell did they get all of these incredible items? Why are they up for auction now and who’s behind all this? 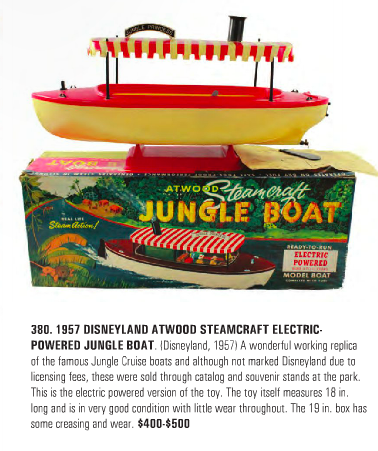 I got a chance to speak with Mike Van Eaton, who is in charge of this auction event and helped organize these items that all came from Disneyland’s past to get some answers. Oddly enough, Van Eaton didn’t intend to start his own gallery at a young age. He kind of stumbled into this by chance. He was in the Los Angeles and found an abandoned wallet lying on the ground. As fate would have it, the person who owned the wallet sold animation cels and, as a thank you, the owner gave Mike a few in gratitude for returning the wallet. 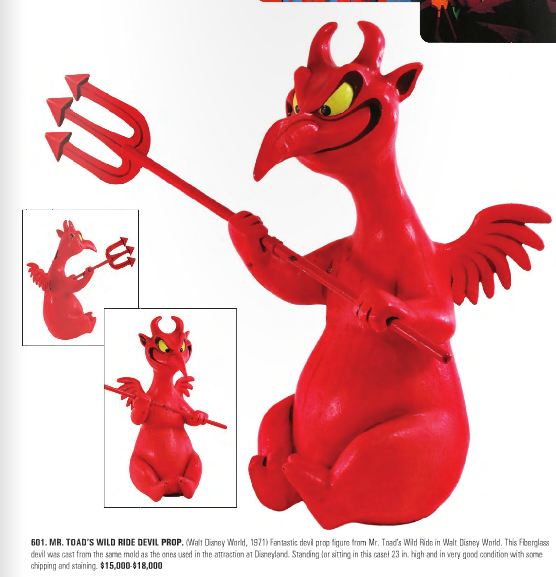 This was fantastic for Mike Van Eaton, as he was always a huge animation fan from a very young age. With a few actual animation cels to start his collection, a new hobby and an eventual career was born. 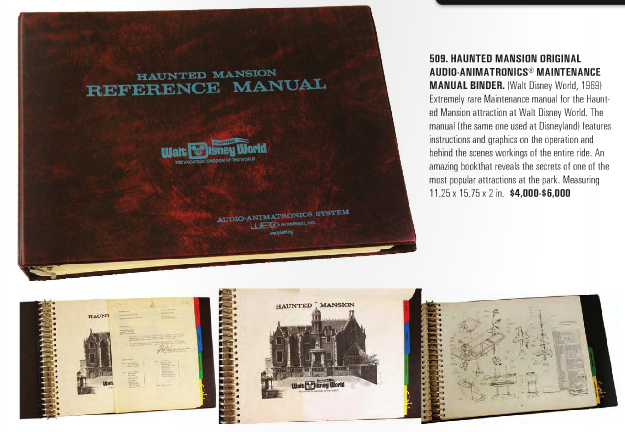 The Van Eaton Galleries have been open now for over 20 years and sells all kinds of collectibles, including animation cels, which naturally crosses over into Disneyana. Believe it or not, the 1,800 pieces in this collection all come from one private collector that has been coming to Van Eaton Galleries for years. 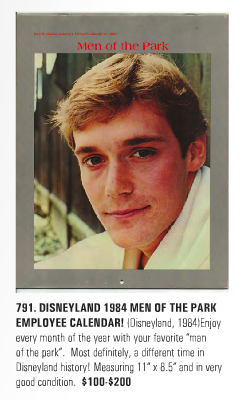 Mike has had a personal relationship with this guy for quite some time and has sold and traded various pieces of Disneyana with the Disneyland super fan. 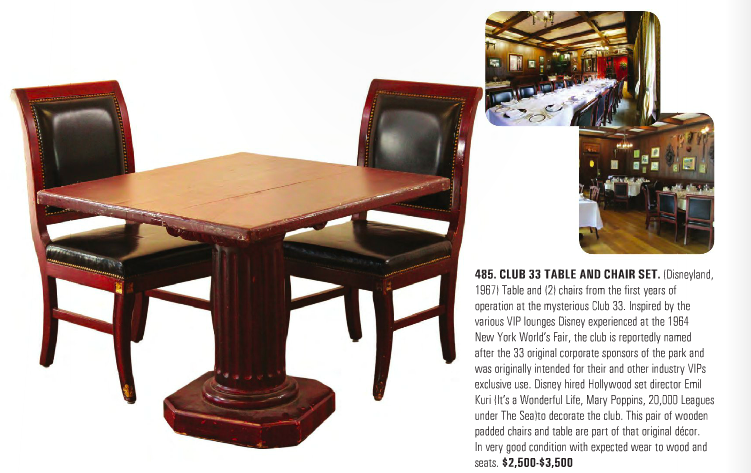 There is no doubt that people have questions about some of the pieces listed in the auction. 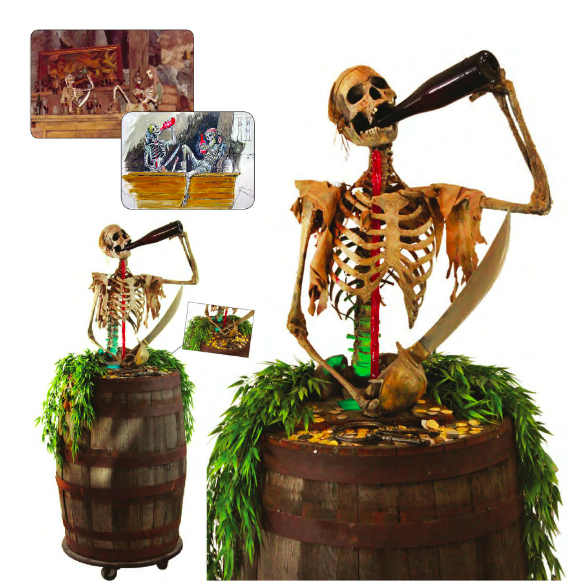 Like the drunken pirate skeleton from the Pirates of The Caribbean at Disneyland. Who’s to say it’s not a reproduction? 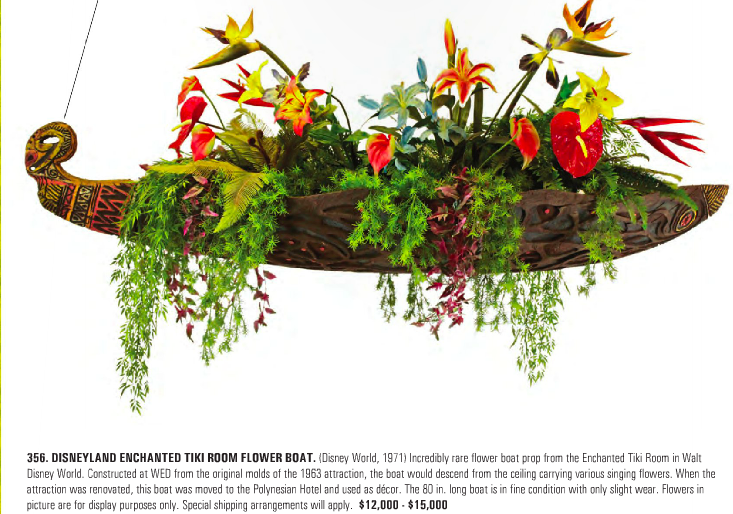 “I had Tony Baxter from Walt Disney Imagineering come in and verify that certain props and figures from the park weren’t recreations and he said everything is the real thing,” he explained. 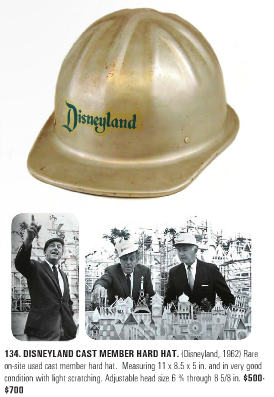 What I love most about The Story of Disneyland collection is that it doesn’t focus on one thing and really covers all of Disneyland. Every land, every attraction. Some of the more interesting items are these skulls and tombstones that were sold in New Orleans Square many years ago. They were made by a local couple who actually made a living creating these souvenirs exclusively for Disneyland. Now that Disney is far more corporate, handmade gems like this are next to impossible to come by in the parks. 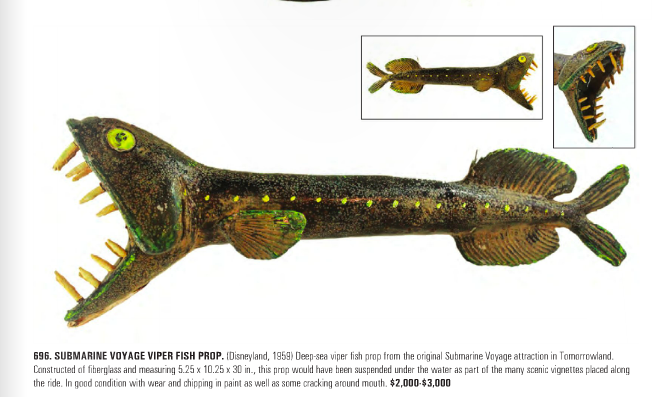 If anything, that’s what impresses me most about the pieces being auctioned off the most. They all have a back story and the collector knows where each one of them came from. For example, there is a tiki bird from Walt Disney World’s Enchanted Tiki Room that was given to a cast member as a retirement gift. 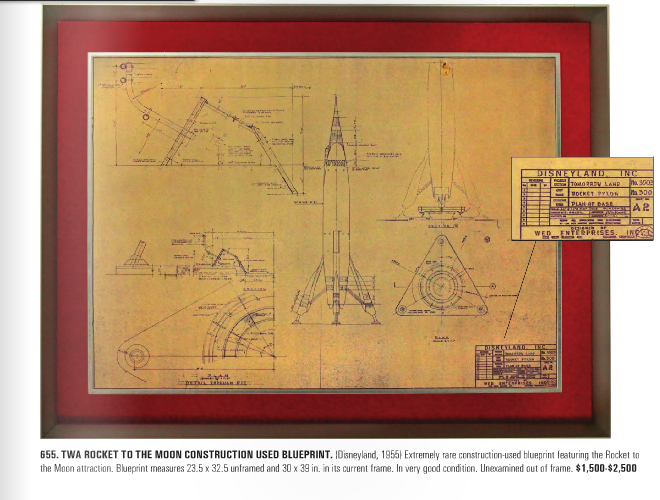 As these things go, sometimes these gifts are sold and end up in the hands of collectors. In other instances, sometimes items just end up in the trash that have gone unused or need to be refurbished. Many times, the trash is taken out and a cast member sees an item and claims it just to have a souvenir and the next thing you know, years later, it’s in the hands of a collector. 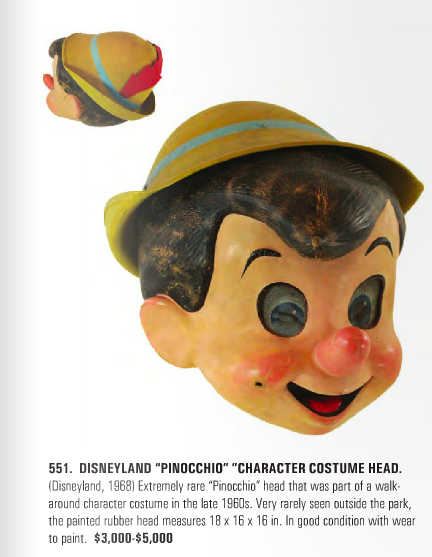 A perfect example is these character heads that were once used in Disneyland of Pinocchio and Mickey Mouse. Indeed, one can claim that even having these on display can ruin the magic for some. Yet, for many of us (including myself), it gives a greater appreciation of seeing how those heads were designed and made. Plus, it’s a great benchmark on how Disney characters have changed over the years in the parks. 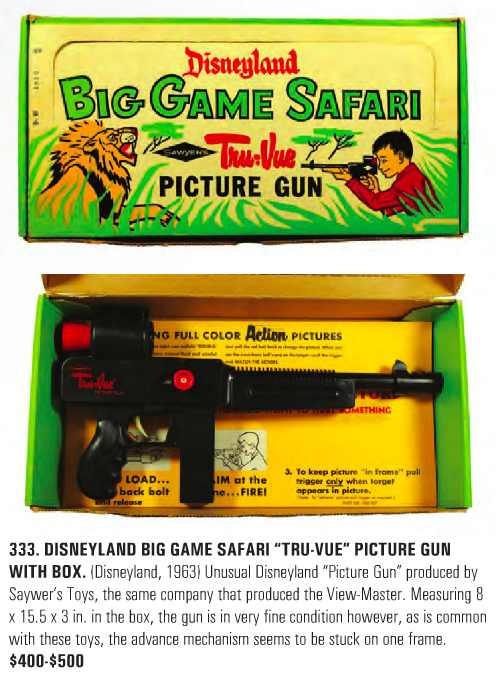 This article barely scratches the surface on the treasures the Van Eaton Galleries is selling for their Story of Disneyland exhibition and sale. 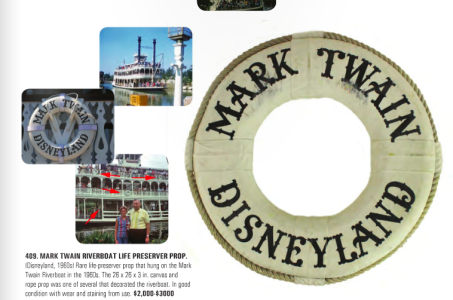 They are even selling copies of the catalog in both soft cover and hard cover versions just so fans can see so many of these rare items and learn a little bit of history from the park at the same time. The auction will be broken up into two dates: Saturday, February 28 and Sunday, March 1 2015. 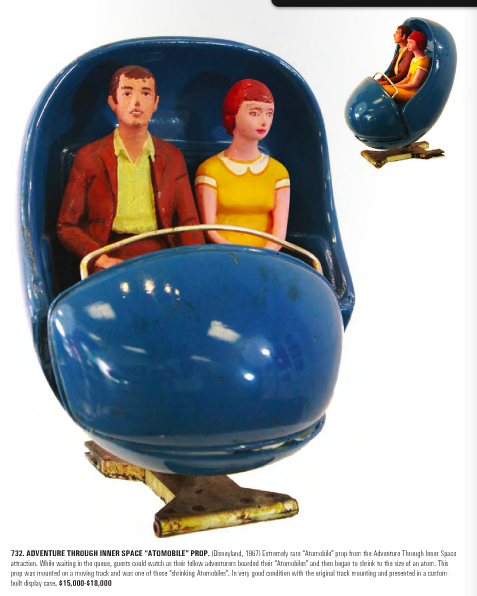 There are several ways to bid on items, including online and at the gallery in Sherman Oaks, California. The day of the auction, they will have a tent set up in their parking lot for the crowds expected to attend the event. In addition, Mike told me local bars and restaurants will be simulcasting the auction on their television screens so patrons can still go grab a bite to eat and keep up with what’s going on as these items find new homes. 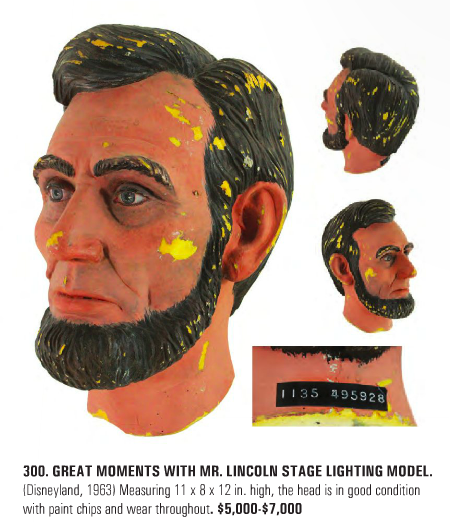 For more information visit vegalleries.com and if you are bidding on anything or actually win any of these items, I would love to know what you guys are interested in owning from this collection. Leave your feedback in the comments section below. Doing any online shopping? Click on any of the Amazon links on this page and it helps TPU pay the bills and costs you nothing extra at all! 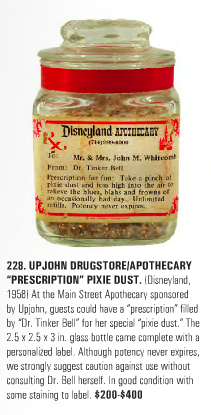 This entry was posted in Disney, News and tagged Disney Auction, Disneyana, Disneyland Artifacts, Story of Disneyland, Tony Baxter, Van Eaton Galleries. Bookmark the permalink. Trackbacks are closed, but you can post a comment.